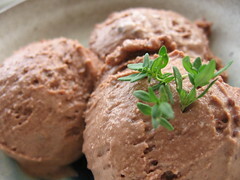 Chocolate-Thyme Ice Cream - Do You Know The Muffin Man? Notes: Making the pâte â bombe was interesting to say the least. I don't have a hand mixer, so I carefully poured the hot syrup into the running stand mixer. Droplets of liquid scattered all over the bowl and then immediately hardened on the cold steel surface. Also, I didn't let all the components cool before I combined them; this may have contributed to the grainy texture. Plus, the thyme flavour was barely detectable. The chocolate I used may have been too overpowering. I'm sure this would be an interesting ice cream, but my sloppy execution led to an inferior product.